Volume 1, published in 2016, covered the history of the Devon & Somerset Railway from its inception to its demise. Starting with the trials and tribulations of financing the venture, then through its protracted construction in the 1860s and ‘70s, takeover by the GWR, two world wars and expansion in the 1930s, the story culminates with the sad decline of the 1950s and its being marked for closure by Dr Beeching, which duly came in 1966. 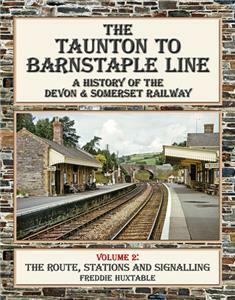 This second volume brings the line back to life, with a detailed descriptive journey along its 44-mile length from Taunton to Barnstaple. This written account of the railway is lavishly illustrated with a superb range of photographs, mainly taken in the 1950s and early 1960s, most of which have not been published before and that serve to emphasise the beautiful countryside through which the line passed. Ex-GWR ‘Moguls’ abound, along with other ex-GWR locomotive types, a few BR designs and some Southern Region interlopers! There is a detailed review of the stations along the route and their development, as the journey progresses westwards over three chapters. Included are numerous detailed track plans covering each location and there are plans too of some of the key civil engineering structures on the route. The final chapter covers the signalling of the D&SR line, its development from broad gauge days, single line working, signal box histories and signalling diagrams for each box. This volume will certainly appeal to locals who remember the line and particularly to modellers but also to many others who may wish to delve in more detail in to the previously neglected Devon & Somerset Railway.